She wasn’t late, she was right on time! I had my daughter just over a year ago. At my first prenatal visit I felt something was amiss when I told my doctor that I knew my conception date yet she ignored me and asked for the date of my last period. She used a standard pregnancy wheel to determine my due date instead of my conception date. Did she not trust me? How could I trust her to care for me during my pregnancy and to deliver my baby? Up to this point I had really felt that she had my best interest at heart. And maybe she did prior to this visit. So I looked for care elsewhere and that’s when I found a doula and midwives who helped me have the natural pregnancy and birth I wanted. In this book I’m finally learning about Fertility Awareness. I’m astounded that in my near 30 years on this planet no one has taught me this method of safe, natural birth control. 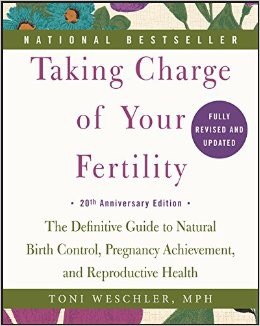 After recently trying the IUD and sharing that I did not feel it was worth the risks or the side effects, someone I barely know but am extremely grateful to in a mom’s group led me to reading this book. I’m thankful for this information and I want to share it with others who have not heard of it, or maybe have heard of it but haven’t gotten around to doing the research yet. The information in this book can empower women to make choices for their bodies and their reproductive health. By the standard pregnancy wheel’s calculation, my baby was due on January 8, 2015; however, I had conceived on April 13, 2014 which means I wasn’t at full term (40 weeks) until a full week later, on January 18, 2015. Had I remained under the standard care with my doctor in the hospital I probably would have been subjected to induction and drugs, among other interventions, and at a higher risk for surgery–all based on an estimated calculation! Call me crazy, but this is enraging to me! It is not only shocking that we subject women to all of these interventions but that we do it based on a mathematical average. It makes me think of the countless number of women who want to have or could have had uninterrupted, natural labors and births and were unable to because of this ridiculous notion that all women’s cycles are the same. No two women’s bodies are the same so how can their cycles be?! My baby could have been forced to come out a week premature because my doctor chose not to listen to me or simply did not want to believe I knew what I was talking about when it came to my body. Baby girl was born just hours before the 18th of January (which was exactly 40 weeks after the day she was conceived) at 9:38pm on January 17, 2015. She wasn’t late, she was right on time! Early, even! It irks me but it reassures me that I knew this all along. If I had known this at the time I could have avoided the unnecessary and stressful monitoring and tests I had to undergo in my last week of pregnancy. It was such an intense experience for me that it brought me to tears! I had to go to the hospital early in the morning and be hooked up to monitors and screens and told I could not leave until my baby moved. She was always active at night– a time when these clinics are not open for monitoring. And no one there is in the business of listening to mothers. I was forced to sit through yet another risky ultrasound when the monitoring and tests proved no results despite the fact that I knew my baby was active and that she was indeed coming very soon because we were connected and I felt her moving every day. I was talked into doing these tests under the notion that if I did not I could be later scrutinized and even prosecuted for neglect and abuse. We are not empowering women or their babies under this model. Instead we are alienating and frightening the very people who are supposed to be honored and cared for during this sacred and unique time. This system would benefit from connecting with mothers rather than making them feel like subjects in an experiment.